The ARTS Park N’ Lot is a community gathering space and outdoor classroom located in the back parking lot of the A Reason to Survive Center. 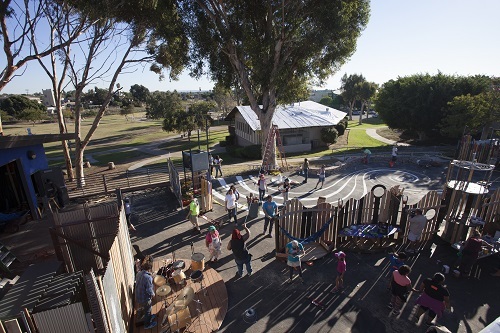 ARTS, the Pomegranate Center and National City recently partnered to transform National City through a “Creating Vibrant Neighborhoods Initiative.” Over the next three years, this initiative seeks to transform 30 spaces in National City and other South County communities into rich, cultural destinations. The ARTS Park N’ Lot was the first project to be completed under CVNI. As part of the Pomegranate Fellow Training, the parking lot was transformed over four days of community design-input sessions and a four-day community build. The space is within walking distance of National City’s City Hall, the public library and is adjacent to a large public park. The ARTS Park N Lot is a 4,800 square foot asphalt parking lot behind A Reason to Survive’s center in National City. Its connection to Kimball Park and to ARTS made it an obvious choice to create a community gathering space and outdoor classroom. ARTS and the Pomegranate Center hosted a fellows training over four months to prepare artists, designers and community activists to lead a community-driven project. Four days of community input and design plus a four-day community build brought community members and volunteers together to transform the parking lot into a gathering place. Creating a flexible gathering space where walls and fences could move, swivel and adjust for future event planning and community needs was the main criteria. The space hugs the corner of the ARTS building, creating a plaza-like space for public use while the movable fences are able to create safe spaces for classes. This edge between public and private space created a special opportunity to develop a gateway that enters the public park and also expands upon the ARTS outdoor classroom. The Build. Community members and volunteers participated in the four-day Park N’ Lot build. Project Consultant and Pomegranate Fellow.